Last year for Valentine’s Day, D and I took a couple’s cooking class at ICE Culinary School in NYC. The theme of the class was “The Great New York Steakhouse” and over the course of the evening, we learned how to make: Shrimp Cocktail, Clams Casino, Caesar Salad, New York Strip Steak, Filet Mignon, Pork Chops, Creamed Spinach, Truffled Mashed Potatoes and Almond Bread Pudding. Everything was delicious and we left the class stuffed and excited to re-make the recipes at home. 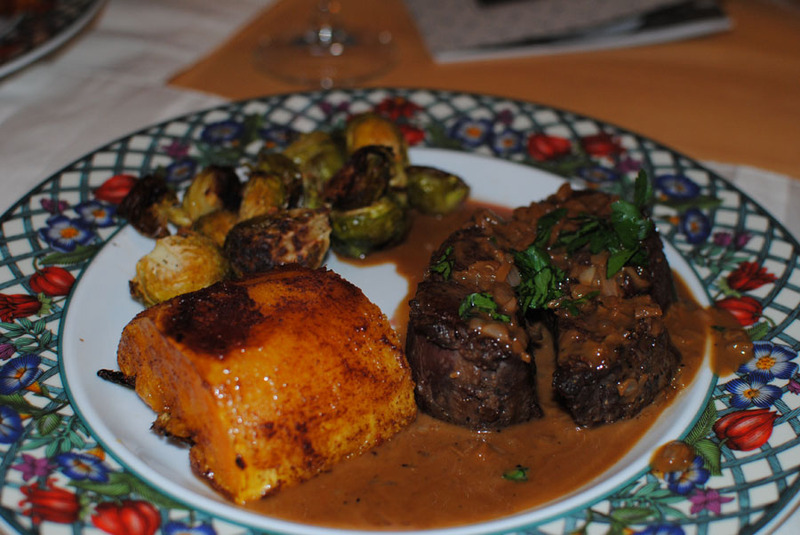 Our favorite dish was, hands down, Filet Mignon au Poivre with Cognac Cream Sauce. It’s not an easy dish by any means but it’s so, so good and the sauce makes this dish really special and also decadent. We loved it so much, we’re going to make it at home on Valentine’s Day this year and open up a bottle of Quintessa wine that we bought on our trip to Napa last August. 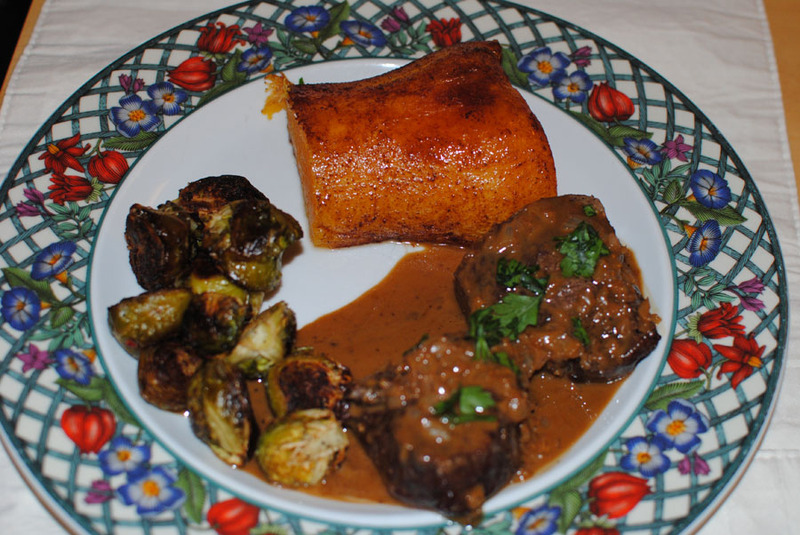 Since the sauce is on the heavier side, I generally serve this dish with roasted veggies (like roasted squash and brussels sprouts seen here) to balance the steak out. Happy Valentine’s Day! I hope you all like this meal as much as we do! 3. Season the filets with salt and pepper just before cooking. *The trick to perfectly seasoned steaks is to use ROOM TEMPERATURE steaks, pat the meat dry before seasoning, season immediately before serving, and ensure the saute pan is hot BEFORE you put the steaks on it. 4. Add the filets to the saute pan and sear both sides. *The steak is ready to be turned over when it gets a crust on the bottom and doesn’t stick to the pan. Patience is very important here – don’t mess around with/move around the steaks once you put them in the pan unless you are flipping the steak over. It should take max 5 minutes per side. 5. Once you finish the steaks, put the saute pan aside and transfer them to a baking dish and put them in the oven until desired level of doneness. Estimates are 10-15 minutes for medium rare, 15-20 minutes for medium, 20+ for medium well/well done. The temperature should be no lower than 130 degrees if you’re using a meat thermometer. *A trick we learned in class is to relax your hand and feel the tendon part of your hand between your thumb and pointer finger. That is how a medium rare steak should feel when you poke the middle of the steak and it’s done. 6. When done, place the filets on a wire race and let rest for 5 minutes. 7. While the steaks are in the oven, prepare the sauce. Using the saute pan that you used to cook the steaks (Pour out the extra oil, but DO NOT CLEAN IT – the “fond” – little pieces of meat that stuck to the pan – adds extra flavor to the sauce), add 2 tbsp. butter and melt over medium-high heat. 8. When melted, add the shallots. Cook the shallots until translucent and soft. This should take about two minutes. 9. Deglaze (take pan off burner) and flambe with cognac. *Trick – to flambe, pour the cognac into the saute pan then tilt the pan slightly so the liquid drains to one side. Move the saute pan over the burner and the flame should cause the cognac to ignite. Off the burner, swirl the liquid around in the pan until the flame has burned off. 10. When the flames have died down, scrape the pan to free the brown pieces of fond. Add the reduced stock and let cook until further reduced by half. 11. Add the heavy cream and reduce by half again. It should be thick enough now that it coats the back of the spoon you’re stirring it with. 12. Finish the sauce by swirling in 1 tbsp. butter. Do this OFF the heat. Season with salt and pepper. 13. Serve sauce over cooked filet mignon and garnish with chervil. 2. Clean brussels sprouts (cut off hard ends, remove yellow leaves). In a large bowl, lightly coat brussels sprouts with olive oil. Season with salt, pepper and crushed red pepper. 3. Spread brussels sprouts on a baking dish (cover with foil if you want to make clean up easier). 4. Roast in oven for around 40 minutes. They should be crispy on the outside but still tender inside. 2. If using whole butternut squash, wash well then cut each in half, lengthwise. Scoop out seeds and gunk inside squash and discard so just the “meaty” part remains. 3. Using your hands, lightly rub olive oil on both sides of squash. Sprinkle with cinnamon. 4. Spray a baking pan with cooking spray and place squash flesh side is face down. Bake for 50-60 minutes (if squash is peeled) or 60-75 minutes if using whole squash. It is finished when a knife can be easily inserted into the squash. 5. Melt butter and combine with maple syrup. When squash has ten minutes or so left to cook, take it from oven and lightly brush squash with butter/maple syrup mixture. The longer you cook the squash with the butter/maple syrup, the sweeter it will be. The glaze will take around five minutes to set so that is the minimum cook time for the squash once the butter/maple syrup has been applied. 6. Remove from oven, cut each piece in half once more and serve immediately.